A drama about a family set in Calais with the European refugee crisis as the backdrop. 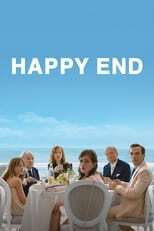 Happy End is directed by Michael Haneke and was released on Dec 22nd, 2017. Director Michael Haneke's Drama & Comedy movie Happy End is produced by ARTE France Cinéma & France 3 Cinéma & was released 2017-06-21.